Ready for some classic southern Louisiana food? This Gumbo recipe is cajun comfort food at it’s best. This stew (actually more of a soup) is full of spicy Andouille sausage and chicken served over rice. The best thing about this easy gumbo recipe is it’s made in a pressure cooker dramatically cutting cooking time. So now you can enjoy this classic cajun recipe is less time. 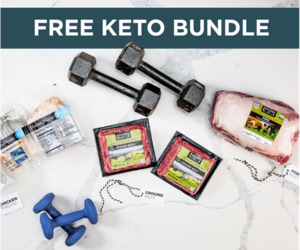 This blog contains affiliate links. When you click and purchase through them, we receive a small commission at no cost to you. I’ll only recommend and share products that I use and love myself. Thanks! I’ll be honest with you. Before now, I’ve always been too afraid to make gumbo. It seemed too difficult to get the roux (mixture of browned/cooked flour and oil) right. I’d hear other people talk about how disastrous their gumbo was because they didn’t get the roux right. Unfortunately they didn’t know it until after hours of cooking. So I just left it alone and went out for Gumbo. On a recent trip to New Orleans, I had my fill of gumbo. It was some of the BEST gumbo I’ve ever had. Even the airport restaurants served a mean bowl. If you haven’t been to New Orleans, you are truly missing out on some great food and a trip isn’t complete without beignets. I don’t think there was anything I didn’t like during my week there. You can see some of the highlights in these Things to Do in New Orleans with Kids and New Orleans Restaurants articles. Another favorite was red beand and rice which by the way is an even easier recipe than this one. You can’t go to NOLA and not have beignets. During one of my meals, a group of food bloggers, restaurant staff, and locals started talking about New Orleans food and Cajun cuisine, especially gumbo. I was let in on a little secret that is the key to a successful gumbo. It’s all in the roux. That mixture of browned/cooked flour and oil needs to be just right. The type of oil isn’t that important. I used avocado oil for its high smoke point, but you can use olive oil, lard, butter, etc. The secret is you whisk constantly and then stir, stir, stir, until you get what looks like peanut butter. It’s not really peanut butter, but you know it’s right when the roux is the color of peanut butter. After I returned home, I tried it and it WORKED!!! I successful made a great gumbo. I have since made this recipe several times and each time it comes out perfect. Cooking this gumbo recipe is made a lot easier in a pressure cooker. I use this Instant Pot 6-in-1 Programmable 6 Quart Pressure cooker. I have this one instead of the Instant Pot 7-1 because I didn’t need a yogurt maker. That’s the only difference between the two. Using a pressure cooker allows me to make gumbo in less than an hour instead of 3-4 hours the traditional way. After the gumbo recipe, I’ll include a few more recipes for you to try too. . There are different gumbo recipes out there, each a little different. I used Andouille sausage from an Oklahoma butcher shop in Stillwater, 1907 Meat Company. It has a mild spice so I used a full tablespoon of Cajun seasoning. If you use a spicer sausage, adjust the seasoning to your liking. The smoked paprika gives it a nice flavor and balance. I didn’t add okra to my gumbo because it’s out of season and frozen just isn’t the same. If you want to add okra, reduce your natural release time by 5 minutes after cooking. Add the okra and return the gumbo to sauté for 5-8 minutes or until the okra is soft. This will give you a nice texture without the okra getting gummy. If you want a gumbo that is more like a thicker stew, combine 1 tablespoon cornstarch and 1/4 cup water in a cup/bowl and stir until lumps are gone. Then add that to the Gumbo after it’s finished cooking. Stir until well combined and the broth thickens up. Without a pressure cooker, this recipe can be easily modified for a dutch oven or stock pot. Create the roux over medium high heat, whisk constantly, and then slow simmer the gumbo. Easy Peasy! Set pressure cooker to sauté and heat 1 tablespoon of oil. Once oil is hot, add the sausage and brown (without the lid) on both sides, about 5 minutes. Remove the sausage to a plate being sure to leave oil/drippings in the pan. Add the cut chicken thighs to the pot and brown on both sides, about 6 minutes. Remove chicken and add to the plate with the sausage. Add remaining 1/4 cup of oil, flour, Cajun seasoning, thyme, and smoked paprika to the pot. Stir constantly and cook until the roux is the color of peanut butter, about 5 minutes. Add onion, bell pepper, celery, and garlic to the darkened roux. Cook, stirring often, until vegetables are soft, about 5 minutes. Return the cooked Andouille sausage and chicken to the pressure cooker. Add chicken broth and diced tomatoes to the pressure cooker. Cook for 15 minute on manual setting and then allow to naturally release for 15 minutes. Taste the gumbo and add, as needed, sea salt and black pepper. To serve: place a 1/2 cup of white rice in a bowl and top with gumbo. My father-in-law can make some great gumbo. However, I have never attempted it. Maybe it is time! Thank you for sharing! This is great for beginners. I was always afraid to make it because if the roux. I guess it may be a matter of preference, Roux for gumbo needs to be darker than peanut butter, closer to fudge. That is when the flavor really comes out. Thanks! I will have to try cooking it longer next time. One should have several shades of roux in one’s Cajun or creole food vocabulary. Many Gulf Coast Cajuns will tell you, the lighter the roux, the darker the meat. (Game, duck, etc.). The darker the roux, the lighter the meat. (Chicken, fish, shell fish.). Be careful with darker roux. In burns in a flash. Don’t forget a little gumbo file, the ground leaves of the sassafras tree. Thanks for your advice Don. I didn't know that about the lightness/darkness corresponds to the type if meat. I will definitely remember that. I've burnt my fair share of roux. I've never tried to make gumbo before, but this looks delicious and simple! It is really easy. I love that it takes less time than the traditional version. 2 quarts of chicken broth was way too much! Not a stew-like consistency like it should be...now trying to figure out how to fix/salvage this dinner. Bummer. Corn starch and water. Most Instant Pot recipes don't do well with thick sauces. Sorry but I'm new to this blog but Gumbo isn't a stew. My Sister-in-Law is Cajun and makes the best gumbo I've ever tasted. She doesn't use tomatoes in it and it's very liquidy - like a soup. She ladles it over rice and it's magnificent. This gumbo is liquidy too. Maybe stew is the wrong word for it. Does your SIL use something other than tomatoes? I've only ever had it with tomatoes. So I'm curious and would love to try her version too. Nicky, In south Louisiana, tomatoes are not generally used. I make a great gumbo and have never used tomatoes. That said, I have eaten gumbo with tomatoes and loved it. I actually cook okra down with a can of Rotel to add to my gumbo. Gumbo is not stew-like. It is more like a soup. Made this recipe and it was wonderful. Only addition was some shrimp that I cooked separate (was afraid it would overlook in IP). Corn bread and some brown rice....heaven! So happy to hear you loved it. Corn bread and brown rice sound yummy. I was born and reared in Ville Platte (flat land for the non Cajuns. Lil) 1) Okra gumbo uses tomatoes, but we’re not talkin’ traditional, everyday gumbo there. That’s a whole different kind of gumbo...probably good for a whole ‘nother episode! 2) Cajun vs. Creole gumbo is another story. You maybe need to do some research. Paul Prudhomme cooks both (great roux making instructions & pictures of what color your roux should be for which gumbo. Chk your local library) 3) My Mamma, or any self respecting Cajun, would not be using whole wheat flour or avacado oil. Brown rice, forget it (I prefer it, myself, but Mamma won’t hear it from me!) 4) Powdered Sassafras leaves make Gumbo File’ (pronounced feelay). File is on every Cajun’s gumbo table & is sprinkled on bowls of hot gumbo over rice. What few seem to know is that my ancestors used (where the term “file’ gumbo” was derived) file’ to thicken a watery broth when added then simmered awhile. Also, once leftovers are refrigerated overnight, the broth will have thickened. Thus you may have to add broth to leftover gumbo. Cajun food came from poor, cook with what’s on hand, kitchens, usually with too many mouths to feed and too little $cratch to stretch to do it. When you see a $90+ total for the groceries you’ll need to prepare this dish, well you’re not cooking Cajun. Sorry to rain on your cooker parade but I’ll give you a roux hint that my sisters (all 4 of them) and families (men, somehow can make great Cajun food. Maybe cuz they aren’t limited by what’s expected of them) have begun using to speed up the process. They all seem to have become converts to premade roux that comes in a jar. Now while I have to say that I prefer to make my own, I cannot tell the difference in their finished gumbos and my own So please don’t give up, folks. There’s a wonderful world of Gumbo cooking out there w/o breaking your hearts or the bank. I think a jar of roux (which someone else has perfected & you don’t have too) is under $5, in 2018!!! Im sure there’s a number you can call where they’ll instruct you on what you “need” without breaking the bank. I can feed a family of six twice on a big pot of chicken gumbo & white rice TWICE for under $35. Don’t let making a roux hold you back. That’s the easy part. Promise. Search for Gumbo Roux online. One quart of chicken broth was more than enough. Why does your recipe ask for two? Did I do something wrong? My gumbo came out delicious using one quart. You didn't do anything wrong, it's a preference. We have always had soupier gumbo. So you can add 1-2. Glad it came out the way you liked it. I might have missed this part but is the chicken skinless and De boned? Yes, use skinless and de-boned to make things easier. You can use bone in, but will have to do the extra step of finding and removing the bones later. Is it 2 cups fresh diced tomatoes or canned tomatoes? I wasn't sure and just used canned, but drained, since that's what I have used in other gumbo type recipes. Thanks! Liz, I used diced canned tomatoes with the juice. The recipe is pretty forgiving and turns out great with fresh tomatoes or canned. Made it tonight for a warming Halloween dinner vs the usual chili. Modified recipe for our tastes, (1/2 onion and 2x the green pepper) and it was perfect! I don't like my veggies really soft so I barely cooked them in step 9, just a couple of minutes. They cooked up fine during the pressure cooking. I think it was a bit soupy and would make it with less chicken stock next time but my wife liked it soupy so to each is own. Next time I think I'll try 1.5 qrts. Served with corn bread corn ? and it was a popular meal with the whole family. Thanks! Thrilled to hear y'all enjoyed the recipe. We like ours soupy, but less broth is still delicious is you want a thicker version. It's a great fall and winter dish. Not a cook here by any stretch, but have eaten my share of gumbo (Home Made by Cajuns as well as Cajun wana bees and in some nice restaurants. Most of the time it has a muddy water look to it and tastes great! If you pour it over rice and still tell that the rice was white it's not dark enough! Great point Ben! Here in cajun country we either have baked sweet potatoes or potato salad with our gumbo. Thanks for the recipe Nicky, can't wait to try it. Sorry, maybe I just didn't catch it but are you cooking it in the IP on high or low for 15 minutes? So I am not much of a cook and this took a lot longer than it would take for most people, I am sure, but I am slow at cutting veggies etc. The end result was probably one of the best meals I have made. My husband loved it too and as a plus, I have tons of leftovers to freeze and enjoy at another time. Thanks for the recipe! I'm thrilled to hear you all enjoyed the recipe. No matter how it took, it's a fraction compared to the original version, but every minute is worth it! 5 minutes is not long enough to make a proper roux! I agree with those who don’t put tomatoes in gumbo. How long does it take normally? The person that talked me through my first successful try try said to cook it until it had the color of peanut butter. I measured it according, but with 1/4 cup oil and the 1/2 cup flour , the roux came out like cookie dough. I added more oil...but still its not smooth like your pic. That is the right measurement for the roux. I've found that mine will do that sometimes, as it cooks it should resemble the picture or a thick liquid. 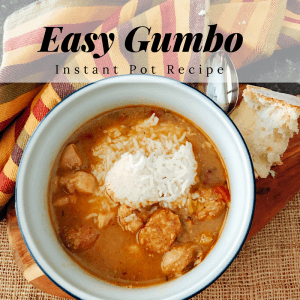 Would love to try cooking gumbo in my instant Pot. I do a dark roux in the oven. Do you think if I made the roux separately and added it along with everything else it would do ok under pressure? I would think it would be okay if you made it separately and then added it in. 15 minutes prep time? Ha ha! 2 quarts of chicken stock! Lot of liquid. Otherwise it was good. I also added shrimp. So happy to hear you enjoyed the recipe Mary. How much liquid did you use in your version? We like our gumbo a little soupier, so I'm curious how you recreated this for your family. Hi, I've made gumbo for most of my 60 years. My husband introduced me to the "roux in a jar". This stuff is AMAZING! The chicken and sausage gumbo tasted exactly like my grandmother's recipe and was so much easier because you don't have to stand around waiting for the peanut butter color. Will leave a link- I am not affiliated in any way nor do i make any money off of any clicks from this post. Just sharing something that has made gumbo making an absolute breeze. Oh and don't forget the potato salad. No true Cajun woman would serve gumbo without it. A lot of us place a scoop in our gumbo. Another must is using long grain rice.